UPDATED to include pix sent in by readers. Well, in the wee hours of Thursday, May 19, 2011, Ft. Lauderdale had a double moon. My cheap digital camera could not capture what my eyes – and those of my father – saw. I saw it at 2:30 AM ET; he saw it at 5 AM ET. The “second” moon appeared as a ghostly superimposition on the real moon, but slightly lower and to the left, covering about 80% of the real moon. The perimeter of the ghostly moon was slightly darkly pigmented so that, even tho it lay atop the real moon, it could be clearly seen. The luminosity of the real moon was stronger, but not by much. We could see through the ghostly moon. We just had a full moon a couple days ago, so the shape was slightly less than full. I spoke with an octogenarian farmer up the road who has also never seen such a thing in his entire life. Searching the web, I found no historical mention of double moon sightings, but did find a few recent ones. So the source of the illusion is most likely not natural, instead being anthropologic in origin. In an Unexplained Mysteries forum, GinaLynn reports she saw a double moon in 2005 in Portland, Oregon – only hers were in different parts of the sky yet still physically shaped the same – three-quarters full. Neither do I. Online scientific sources are silent on the matter. I suspect that all these years of chemtrail spraying and industrial and military pollution caused the appearance of two moons. It could also be a result of radiation from Fukushima. And that’s a horrifying thought – that we’re degrading our atmosphere so much that we now have the appearance of two moons – and two suns, as recently filmed in Asia. BoKnowsEntertainment compiled two videos apparently showing two suns in Asia earlier this year. The first video is from Bangkok and shows the suns in different locations, so can’t be explained by optical illusion. Wiki notes they’re also called sun dogs, an optical illusion caused by ice crystals. Aristotle even saw them. They’re supposed to be at the same distance above the horizon, in the same part of the sky. A moon dog, on other hand, “is a relatively rare bright circular spot on a lunar halo caused by the refraction of moonlight by hexagonal-plate-shaped ice crystals in cirrus or cirrostratus clouds. Moon dogs appear to the left and right of the moon 22° or more distant.” Here’s a great picture of one. There was no halo in last night’s double moon, and the ghostly moon was as big as, and partly on top of, the real moon. So what we saw was no moon dog. This entry was posted in Environment, Geoengineering and tagged double moon, double sun, moon dog, paraselene, parhelion, sun dog. Bookmark the permalink. I’m in Australia and my son took a few photo’s of a two moon appearance on the 17th of May 2011 and one of them appear to have some kind of an atmosphere surrounding it, he also noted that there were infact very defined chemtrails at the same time. Hi Kathie, can you post that photo? Hi, I would like to but I’m still trying to work out how to upload a photo. I have the same question. Rady, can you help, please? Between 08:00 and 09:00 this morning, an 8 by 7 chemtrail grid was deployed over Neustadt/Weinstrasse. Within two hours the sky, which was cloudless at 08:30, was completely overcast. Perhaps I’ll soon have an opportunity to photograph a “double moon” here. Or, email them to me and I will update the article. Thanks for posting, Kathie! I believe you saw the grey disc. Please also say whether you took the photo in the open or through a window pane, and give an estimate of the angle between the moon and the grey disc as seen from your position. From the angle and a guess about the minimum distance to a hypothetical “lower aerosol layer”, I could calculate the distance to a hypothetical “upper aerosol layer”. That wouldn’t prove anything, but if the result turned out to be physically implausible, the double-veil idea could be put to rest for the time being. I am in Seattle WA, and at 4:30Am Friday May 20th, I most certainly saw 2 moons- I have been trying to research online to see if anyone else saw it, and you are the 1st that I have found. What i saw was a bright moon, then a second one to the right of it and slightly lower- the 2nd one was not bright but you could see all the details of the moon’s surface. E-mail it someone who can upload or go to photobucket and load and use link. This is a very valuable thread. Please keep the reports coming, being sure to indicate whether the moon was observed directly or through window panes. The double image of the moon as shown in Karen Perreault’s photo looks like a partial reflection, partial transmission phenomenon. The effect is commonly observed when viewing a bright object at night through double-glazed windows. As long as the window pane is not normal to line between the observer and the bright object (i.e. 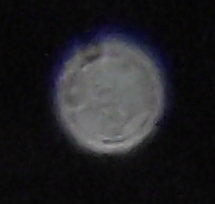 you look through the glass at an angle), a bright image and a secondary dim image are usually seen – further images in the series are normally too dim to be visible. You can draw a diagram to visualise how it works. If each of the partially reflecting media (e.g. glass panes) reflect 10 % of the light and transmit 90%, the secondary image will be only 1% (and the tertiary image 0.01% …) as bright as the primary image. To cause the observed phenomenon, the reflecting media in could be arranged as two closely-spaced layers located near the observer (the double-glazing case) or as two widely-spaced layers located far from the observer. As the reports of “double moons” rapidly accumulate where previously the phenomenon was unknown, the grounds for suspecting a novel cause (i.e. not just a sudden increase in the frequency of people reporting multiple reflections in double-glazed windows) become stronger. In principle, the effect could be caused by the presence of two aerosol veils located at different heights in the atmosphere. The physics is exactly the same. As everyone can observe for himself or herself the progress of aircraft operations in which aerosols are sprayed in the atmosphere, the “double moon” effect is in fact something we should now expect sometimes to see when looking through open windows. An interesting characteristic which may be inferred from a “double moon seen through open windows” phenomenon is that multiple aerosol layers must be deployed at markedly different altitudes. A corroborating circumstance is that various published patents contain proposals for just such atmospheric modifications for purposes including communication, energy accumulation and energy transfer, often in defence contexts. I think you’re right, Thalassarche — I bet Karen shot that thru her window. in fact, when I was researching double moon, I came upon many pix from folks who deliberately shot thru double or triple paned windows to get that effect. When I saw the double moon (thru the screen door), I immediately went outside and rubbed my eyes to be sure of what I was seeing. We could actually be seeing signal noise in the existential wave spectrum that causes dimensions to collide with each other. Has anyone seen a double of themselves lately? I think it is probably atmospheric related, but the dimension theory sounds so much more exciting. DN: I LIKE it! Good one that. I’ll have to discuss it with myself and myself of course, but I like it! hmm… what will atheists be convinced of? btw, i personally think aliens are already here — why else would they be systematically altering the chemistry of the skies, waters and land, and altering the genetic composition of plants and animals? My name is victoria, a nigerian,I saw double moon at exactly 3:13am on the 3rd of june.i snaped the picture from my window but my phone camera is not that strong so the picture is faded.but you can still see the moons.i was shocked so quickly came to goggle 2 search for double moon, then i was able to find you. It is the Black hole our Sun goes around. Loads of evidence. And it will cause three days of darkness just before Passover, either next year; 2012 or in 2013. Then it will spew Gamma radiation and three electrical blasts will cause all parasites and their bacteria, and their viruses to die, and this will cure all illnesses caused by these. At present it is just west of the Sun, hiding something coming from that direction. To upload photos… email them to me and I will update the article. The US military has been chemtrailing the DC since March 3, when the President of Mexico came to town. Every day grid patterns, east to west, north to south, many X marks the spot hanging over the White House. Started slacking off around May 1st, plenty yesterday morning though. And I thought we were broke! But we still have the money to kill off those of us who can’t afford to get out of dodge like the congress men and women. My girlfriend and I were laying in bed on Sunday night in Perth Western Australia when we noticed the moon was very bright and the moon beams were in the shape of a crusifix. We thought it was a trick with the light through the window so we went out side and the image was the same. I’m not into astrology nor and I a religous nut or believer of UFO’s. The best way I can describe it was the moon was 3/4 illuminated (not a full moon) and if you were to imagine the round moon was 2cm in size the beams were each about 6-8cm in length coming from the moon in the perfect shape of a cross. I regretfully didnt think to take any shots of it 😦 . do you think it is related to what you have all seen on the other side of the Earth? we didnt see two moons but the crusifix was so real looking Regards Mark. I could not link to this Project Bluebeam. All I could find was that it was another “mind control” thingy. Don’t you think they have enough of those already? Anyway, it ain’t working in MY neck o’ the woods. HA! I didn’t take the photo mysef, my 14 year old son took the photo, he was trying to capture the chemtrails but because it was dark he was unsuccessful, the photo’s were taken from outside in country Australia, He has no idea of distances or angles, but we do have another photo that aws taken at the same time, but in that one the odd thing is it’s much smaller as if he took them from much further away, he said that the first photo was taken facing the camera just above the shed roof and the other was taken from about 6 steps to the left, I have’nt uploaded the more distanct looking photo because it’s not as clear. I have no idea what was going on that night but I did send the photo’s to Nasa with an email asking them to look at them and let me know what they think, but they still to date have not replied. Hi, we could try another approach. Was the other photo you describe, the one in which the grey disc is smaller, taken at about the same time as the picture you sent to Rady? And are both the moon and the grey disc in the picture? If so, does the grey disc appear to be substantially larger or smaller than the moon? If the photos were taken in close time sequence and there’s a substantial difference in the size of the moon compared to the grey disc in one photo but not in the other, then I’d say it’s unlikely that the grey disc corresponds to a reflection of the moon from a lower aerosol layer to an upper aerosol layer. In that case, I’d have no clue what you might have seen. Please let us know what NASA says, in case you get a reply. My friend made in Taiwan. She say news clip translation. North pole ozone layer depletion equal more uv ray get thru then norm. Hits ice crystal and makes reflection. Case closed. Chem trails? No explanation. They didn’t use to exist like today. Either THEY want to lower the exponential destructive population or save us from ozone depletion. In the other picture I have, the grey disc was quite a bit smaller than the normal moon on the pic and it was taken less than 2 minutes apart from the above picture. This is amazing stuff, kinda scary…I can’t believe there is no scientifically recognized explanation, but then again, is there and they are just not prepared to share it with us “plebs”???? I’m gonna be looking at the moons here in upstate NY alot more closely from now on! Thanks Rady, this is a VERY valuable thread. I wonder what SOTT would have to say about all this? hm…. I never know about that. I work in Zambia Africa. I heard from a friend there would be meteor showers early in the morning on 22 October 2011. so I went out at three o clock and was disappointed when I saw no meteor showers. But I did see something better. It appeared to be two crescent moons next to each other. I thought I was seeing double so I called the night guard. He confirmed it. Just to be sure I took out my digital camera and took a few photos. My zoom on the camera is not great, but when you zoom in on the computer you clearly see it: two crescent moons. Still don’t know what to make of it though. that’s probably a moondog, marinus. Here’s a great picture of one. Hi, I saw something similar tonight..please email me, I think I took some decent pictures and videos.. Okay, it’s November 10, 2014 in West Tennessee and I just saw a double moon, almost exactly as Rady described. My second moon was superimposed, but directly below the real moon rather than slightly lower and to the left. It was also only about 50% the size rather than the 80%. I googled to find anything on the phenomenon and I found this page. Interestingly, my wife could not see what I was seeing. I don’t know if this is an explanation but she wears glasses and has difficulty with night vision. I don’t, on either count. She claims I was having flashbacks. Wow! It was very cool. I saw a double moon on the night/early morning of the 9 march 2015 in the uk. Got up in the night (sleepless), something made me look out the window (reading the above, it is a double glazed window) and saw the moon, almost full and a smaller (about 60% the size of the moon) almost full moon to its lower left. Redder in appearance. I moved into a different room, came back, looked out the window and I could only see one moon. I goodled the next day to see if it had made the news or something. I cannot fathom it. I have seen the exact same thing as the picture “Double Moon 4-17-2011 Sioux Lookout, Ontario. Photo by Karen Perreault” last night! I saw the same thing last evening 10/12/16 and captured some images.